As I was growing up in the 90’s basketball was a big deal. To this day, I still associate Christmas with watching the Bulls, and think of Chicago romantically even though I’ve never been there. You see, there was a player at the time that dominated the sport, and escalated it into popularity it had never seen before. This was a player that earned six championship rings, redefined the game, and had abounding cultural influence. You probably know him best from his role in the movie Space Jam. Welcome back to The Inquiry Cycle, a series that looks into curiosity-inspired, process-driven, intentional deck construction. Today we play a quick pick-up game as we draft a popular new legend in white. Goin’ hard in the paint it’s a mono-white general with repeatable card draw. Redefining the game! I was in the final stages of constructing two new decks (Goad Time Grenzo & Oloro Math Test) when Sram was released, and I did not think I would have the funds to create yet another. I usually build decks to maximize effects, and get a rotten feeling if I know I have to leave something out that belongs. Thus I’ve never made a deck with a strict budget. However, I also knew I’d regret leaving this general on the bench for too long. How do I build Sram budget? Sram’s trinity of card draw effects reminds me of the classic basketball team from my youth. Michael Jordan was legendary and a player of such caliber he was unmatched in his time. He was also very expensive (having a salary greater than the rest of the team combined). Drawing a line to Sram, this is how I view the “Equipment” spell portion of his ability. Sram can easily and often, according to EDHREC data, be built as an equipment matters general. No doubt this is a powerful route. 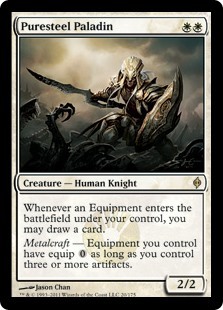 However, cards like Puresteel Paladin, Stoneforge Mystic, and the rare equipment themselves add a price tag to the deck that we’re just not interested in. 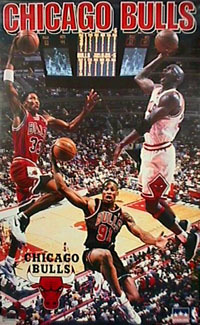 Scottie Pippen was one of the most versatile players of all-time. At small forward, he handled the ball like a point guard, scored like a shooting guard, rebounded like a power forward, and during his prime was on the All-Defensive First Team eight consecutive years (1992-1999). If it looks like he was my favorite, it’s because he was. While the masses watched the Bulls for #23, I wore a #33 jersey. 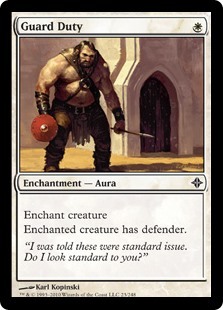 In magic, white’s “Aura” spells often play multiple roles while being defensively tact. They also tend to have low converted mana costs (CMC) making it easy to draw cards with Sram and spread spells across the battlefield “longer than Pippen’s arms”. Naturally, they are often budget. We found our franchise player! 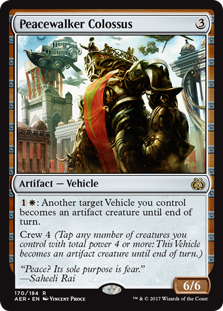 Of course there’s the “Vehicle” portion of Sram’s ability too. Like a Dennis Rodman, we could put vehicles in the game to run people over. Flagrant. Obnoxious. Green hair and feather boas. We won’t be doing that. No. Once I settled on running a budget Auras version of Sram, next I had to decide on the strengths of my team. What are my favorite white Auras? White offers a unique suite of aura flavoring that other colors can’t match: Pacifism effects. A few years ago I got back into Standard with a Pyxis of Pandemonium pillow aura deck that tried to win with Altar of the Brood. It was terrible, but I remember one FNM game I was trolling a good stuff player so hard that a crowd gathered. Several people audibly commented, “What the hell is going on?” Then when I smashed Pyxis, flipping ten do-nothing auras and milling my opponent out, he told me he never wanted to play magic again, and promptly left the shop. For some reason I love the feeling of canceling a threat while it stays on the board. It’s easily foiled, but oh so satisfying to put your opponent in a position where they look down at their board and see their own Saskia rendered the object of Kirtar’s Desire. Plus there are plenty of cheap (both in monetary cost and CMC) auras of this variety; to name a few: Gelid Shackles, Oppressive Rays, Cowed by Wisdom, Weight of Conscience, Forced Worship, Arrest, Hobble, and Cessation. It’s worth mentioning Spectral Grasp and Vow of Duty feel like playing a sixth man on the court. This is a good time to mention alternative style nullifying effects such as Darksteel Mutation, Soul Tithe, and Faith Unbroken. Cards like these go a long way towards diversify our control options. Plus having access to Muzzle, Defang, or Temporal Isolation against things like Vial Smasher or Nekusar is clutch. In the hoop dreams days of the NBA defense didn’t just mean guarding players, it meant guarding yourself against other players. Before he owned an Arby’s, bruisers like Karl Malone ensured the hardwood was a punishing place by offering free delivery on elbows to the face. 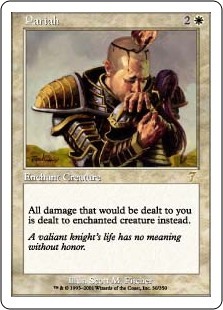 Certainly as EDH players we’ve come to know that the battlefield can be punishing too. How do I keep Sram free from injury? 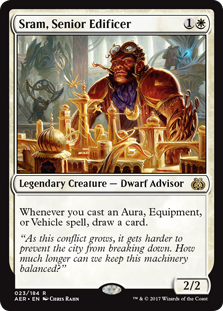 It seems like removing equipment from the deck leaves us with a naked, unarmored Advisor, but fortunately protection is something white Auras do quite well. Thus, our Sram will seem iridescent in a uniform of Auras: Shield of Duty and Reason, Mask of Law and Grace, Flickering Ward, Cho-Manno’s Blessing, Pentarch Ward, Floating Shield, Spirit Mantle, Unquestioned Authority, Inviolability. 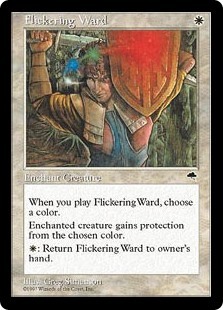 We also have some immunity effects in Flickerform, Hyena Umbra, Felidar Umbra, Gift of Immortality, and Angelic Renewal. 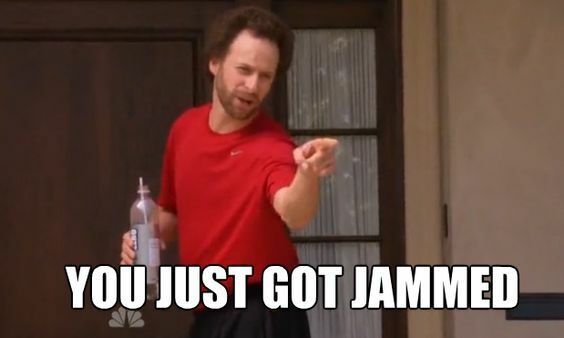 Karl… you a bad mailman! Sram isn’t scared of your elbows or your cowboy hats. How do we beat The Monstars of the format? First, we dribble circles around our opponents by casting and refilling on spells much faster than they can. Pearl Medallion, Hero of Iroas, and Nykthos, Shrine to Nyx will go a long way for speed. 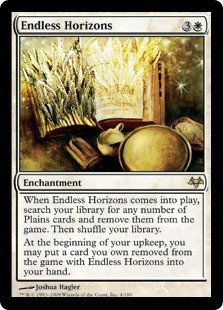 So will Endless Horizons to add quality to our draws. 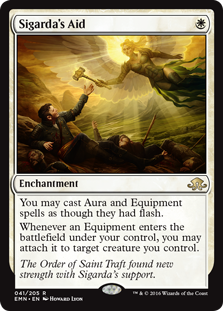 Next, while it isn’t maximized in a deck without equipment, Sigarda’s Aid still changes the rules we normally have to follow. With it, for example, we can pacify in response to an opponent’s Lightning Greaves equip. In a given game we have the chance to count the number of times we wag our finger like Dikembe Mutombo. 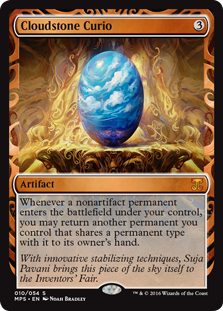 Better still is the synergy from Cloudstone Curio. 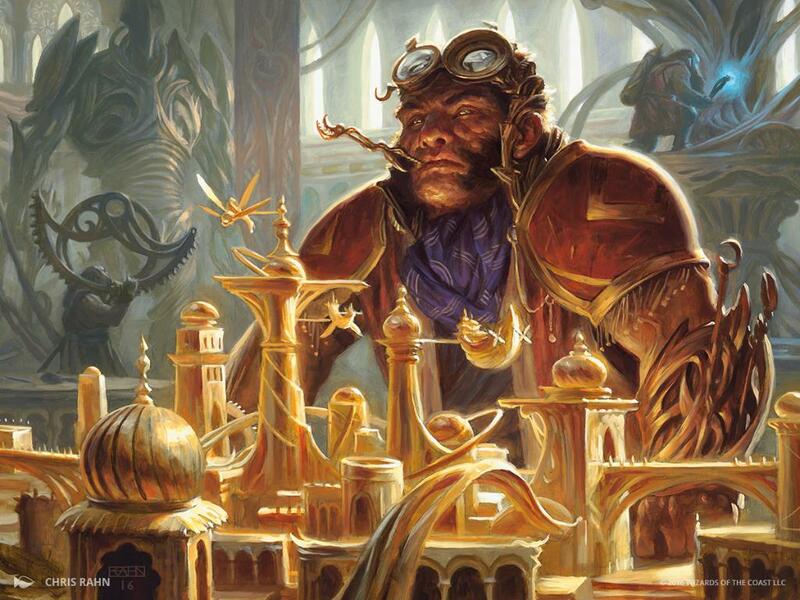 Whether we’re pump-faking with a Sram in play to draw cards, or if we’re playing a zone defense by reassigning control auras to needed places depending on boardstate, fun will be had. Finally, some people are boring and play hexproof creatures. Arcane Lighthouse, Sun Titan, Prison Term, and Cleansing Meditation are sneaky ways to double team a ball hog. There’s also Wing Shards, plus a helping of lopsided wrath effects, Divine Reckoning, Winds of Rath, Tragic Arrogance, which are also good when we reach our threshold of too many creatures to pacify. As it stands, this deck costs about $60 without the Snow-Covered Plains, but given the pieces I already had or was able to easily trade for, it only cost me in total under $30. Swish! I had the chance to play the deck for a few weeks now, and it’s become one of the most alluring I’ve ever built. It does things mono-white has never been able to do, and really can be spectacular to watch. Surprisingly, the strongest card in the deck so far has been Pariah. 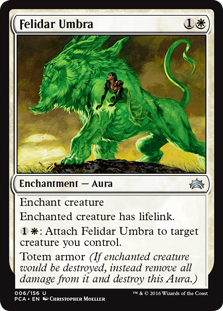 You can imagine a high toughness Sram with protection from four colors, protection from creatures, shroud, immune to damage, totem armored, and immortal is pretty good with the damage re-director slapped onto it. It’s a joy akin to playing NBA Sram and goal-tending my way to “On Fire” status. 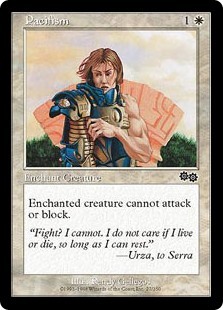 However, as exciting as the deck is to play, a revision that needs to be made is to include more voltron auras. For the sake of shenanigans I intentionally left simple pump effects like Helm of the Gods, Ethereal Armor, and Daybreak Coronet out of the list. Unfortunately, access to only a few win conditions in Kor Spiritdancer or Sage’s Reverie has seldom worked out, and I’ve come to realize that chipping away for 4 or 5 commander damage at a time just gives opponents too much time to exhibit poor sportsmanship and make me the victim of a basketball jones. Eric is a graying family man, math teacher at an IB public high school, and a member of a casual weekly EDH playgroup in Fresno, California. He enjoys interactive play and complex board states, and has only recently resolved to include win conditions in the decks he builds.